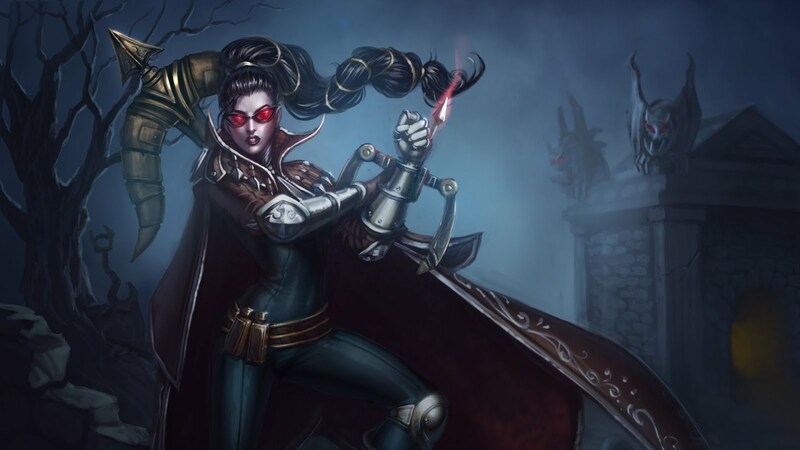 I bought this wig, because I wanted to cosplay Diana from League of Legends and I searched for white long wig. I was totally unexperienced and bought a 100 cm long very nice snowy white wig with parting in the middle. And as I got more and more experience in cosplaying, I realized this wig is totally not suitable for combed back Diana's hair. 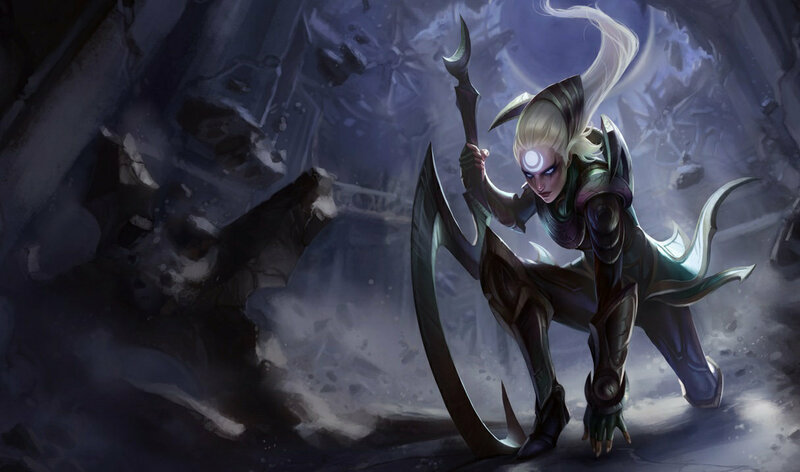 Eventually I decided not to cosplay Diana, but I keep my wig for streaming or maybe for some future cosplay, because I always wanted to cosplay white haired character. I bought this on e-bay, but it's now about 2 years ago, I actually had to bid on it and it cost me around 500 Kč (it seems it is cheaper now!). 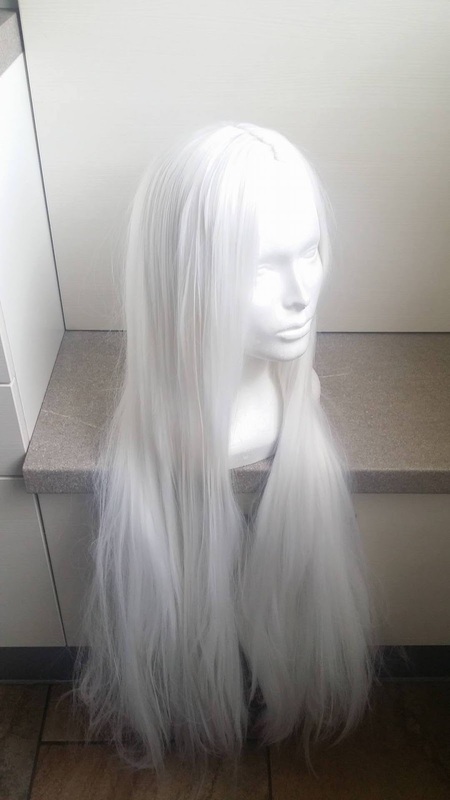 But the auction showed real pictures of this wig and the quality of the wig is pretty damn high - the fibers are silky, snowy white and it feels like human hair. I bought this blonde wig on e-bay for my stream and for my funny review of graphic card I did. 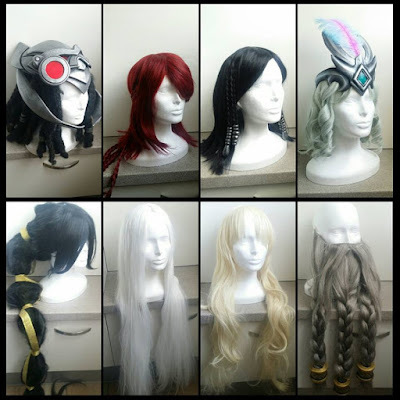 I needed it really fast and I didn't really care about quality, since it is not for cosplay purposes. 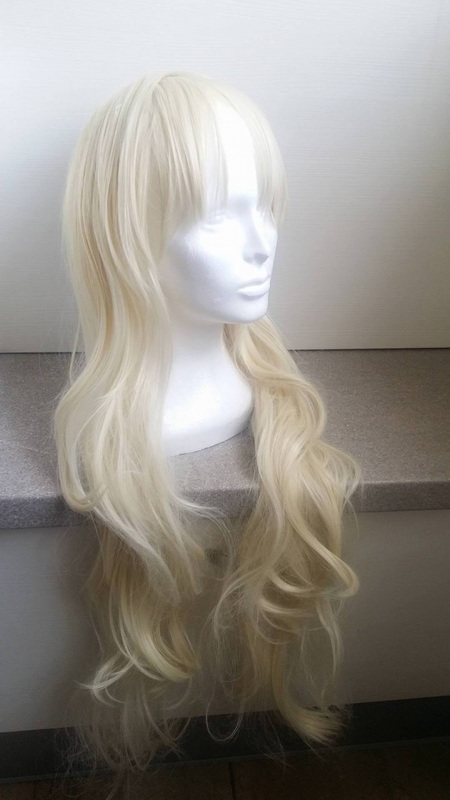 It's about 80 cm long, it has bangs, it is kinda thin and the wig cap can be seen through the hair on some places, but I don't care because the color is good (bright blonde) and looks naturally blonde and not yellowish and it serves me well. I bought it from a seller, that had stock pictures like other 1000 other sellers, but i bought it quite cheap - around 230 Kč = 9 Euro. I wanted to buy a wig for my Ravenborn LeBlanc cosplay and stay true to both splashart (white hair) and in-game model (green hair), so I've bought a wig, that was white with slight greenish tint from e-bay, that I curled wet with curling iron. 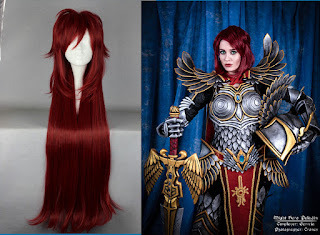 I found a seller with real pictures and quite a good price, but it was evident the wig would need to be curled. 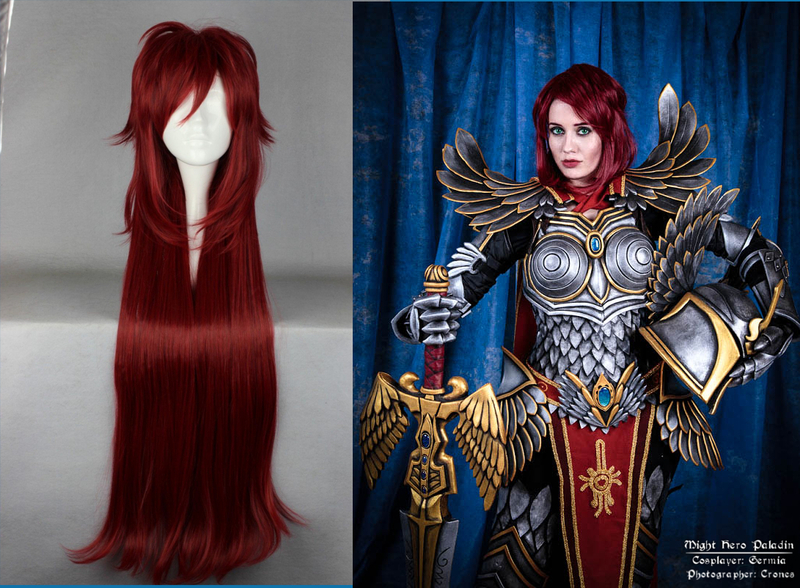 It cost me around 320 Kč = 12 Euro (but unfortunatelly the wig auction doesn't exist anymore). I've bought two short wigs, that were too short for my cosplay (appeared longer on the picture of the seller, but were shorter in real life - read my article about cheap wigs to avoid fails like this). 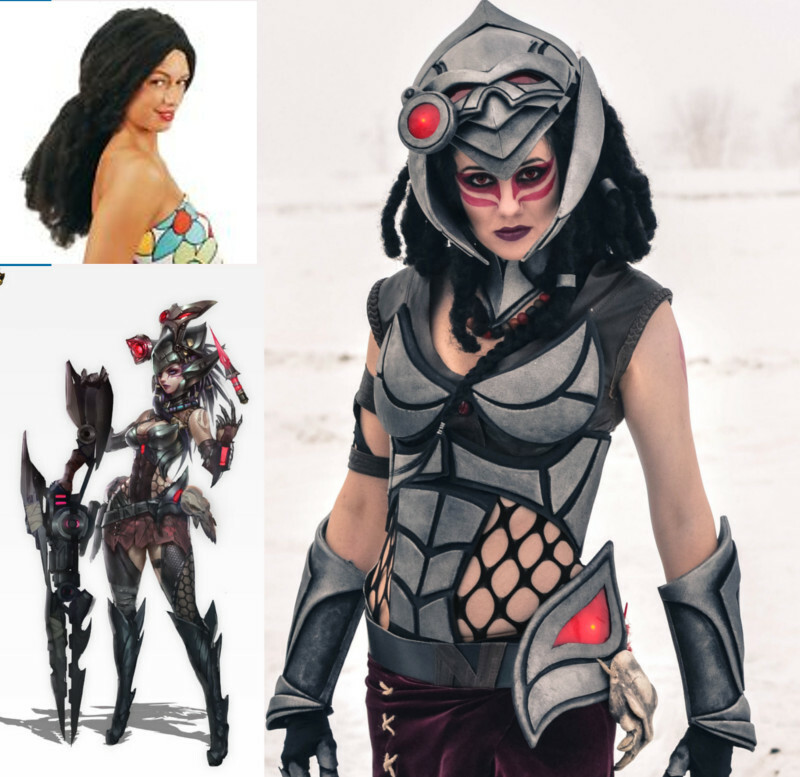 I needed a wig with hair up to shoulders long and two braids on each side of the wig. 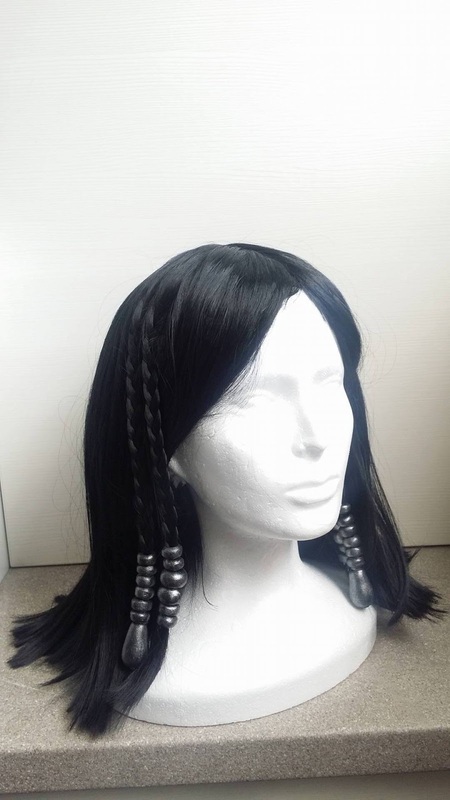 I thought I can buy a cheaper short wig and two braided hair extensions - it was a bad idea - the color didn't match and short wig are often shorter than they appear on the picture. 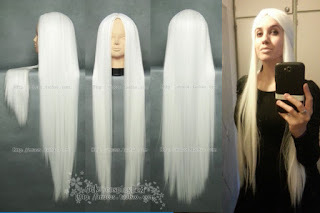 So my third try was actually a really long wig, that I cut short and used the rest of the long hair to make four braids. 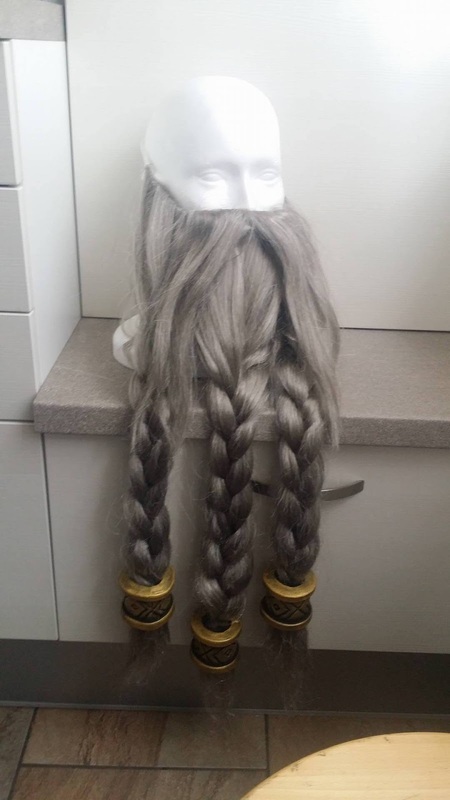 I cut and styled it to match my paladin Ymoril character and sewn and glued the braids into the wig. 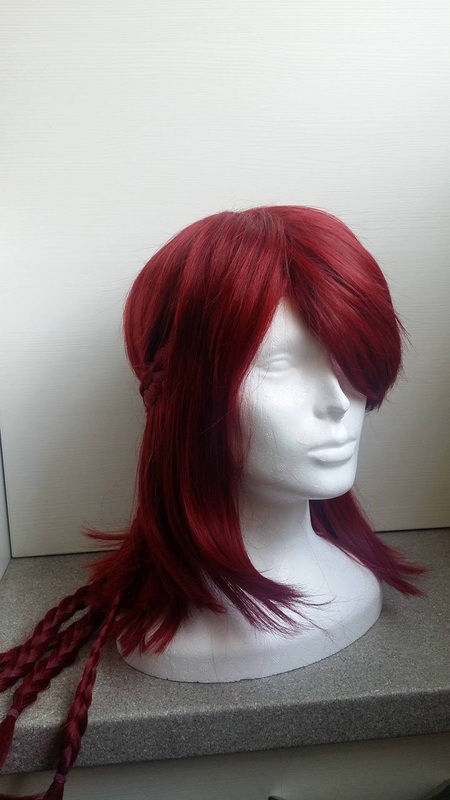 I was also surprised, that the color of the wig is really really natural - the fibers color ranges from light red-orange to dark red and it looks pretty damn good. 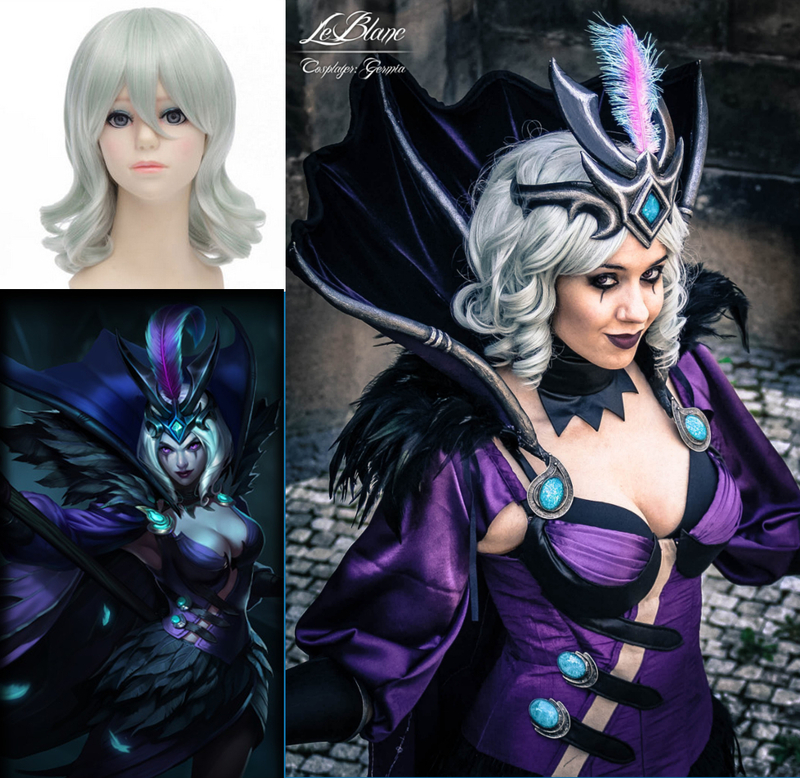 The wig was cheap - it cost around 270 Kč = 11 Euro and I followed all my advices from the tutorial about buying cheap wigs from e-bay and it was totally worth it. 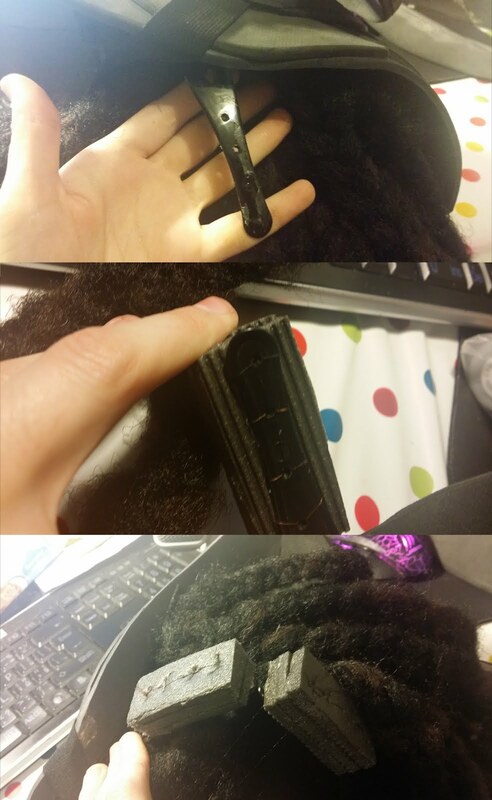 I've bough this afroamerican wig and looked like Whoopi Goldberg - so it had to be braided. 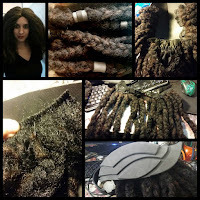 I've made some dreadlocks, but it didn't look good, so i've decided to braid the wig in medium braids (classical - from three hair straps) and i think it looks more like dreadlocks than real dreadlocks, lol! It took me a whole day to braid it. 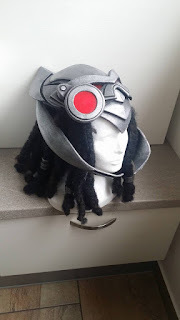 Then i made the helmet from EVA foam, cut the wig in straps and sewed it inside the helmet. So the hair is portable now! I have to admit the wig was really weird. 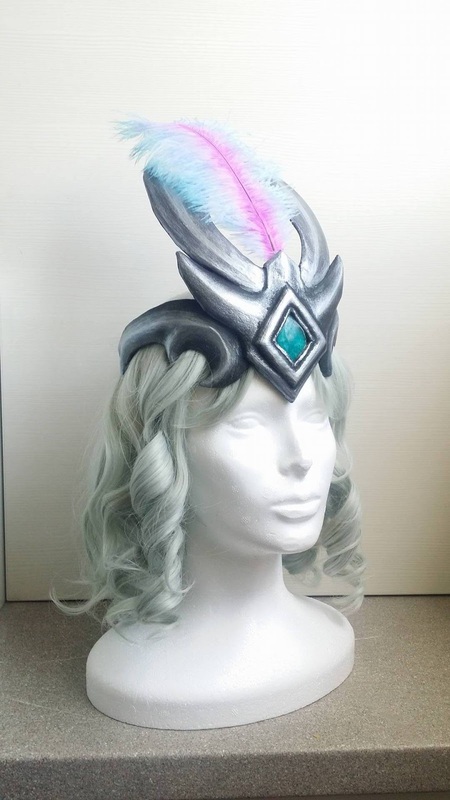 Imagine a headcap from a fabric and the hair straps were sewn only on the borders of the wig and on the parting of the wig. I don't know how much it actually cost me, but i think it was around 400 Kč = 16 Euro. I've learned from my experience buying a red wig for my cosplay of Paladin, so I have decided to buy rather a longer wig, that could be styled and cut to fit Pharah. 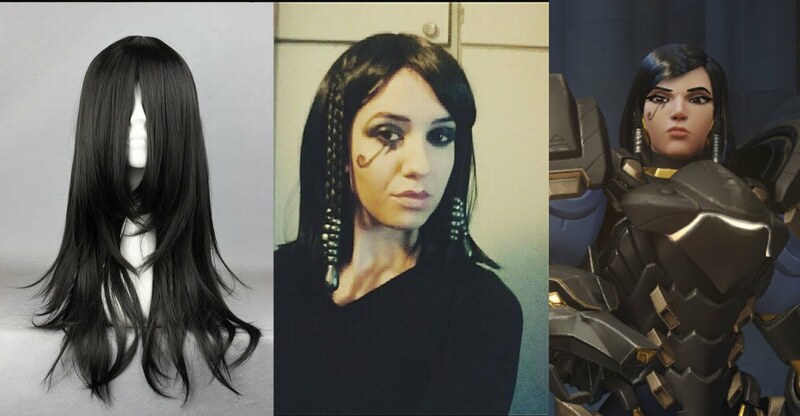 And as you can see, I've bought a 60 cm long wig, that is much more than I actually needed, because Pharah's hair is reaching up to shoulders. But I liked the bangs, the seller, the color and the pictures, so I decided to rather style and cut it myself. 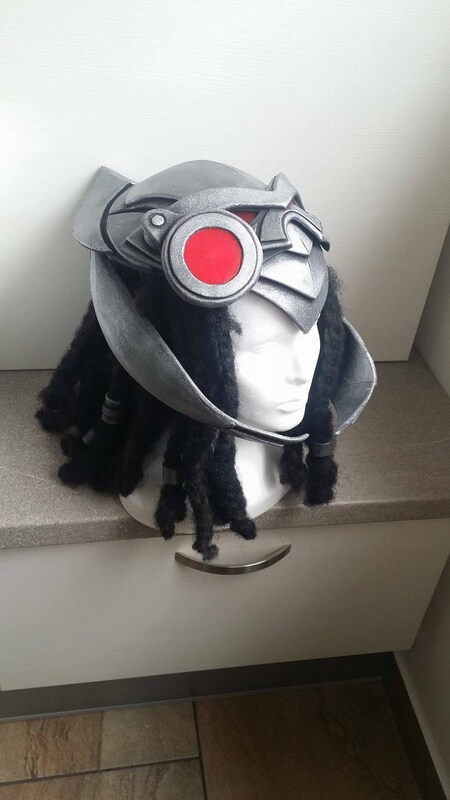 I cut the wig and took two straps of hair right next to the bangs and braided them and then I glued my beads made out of black polymer clay and silver acrylics to them. 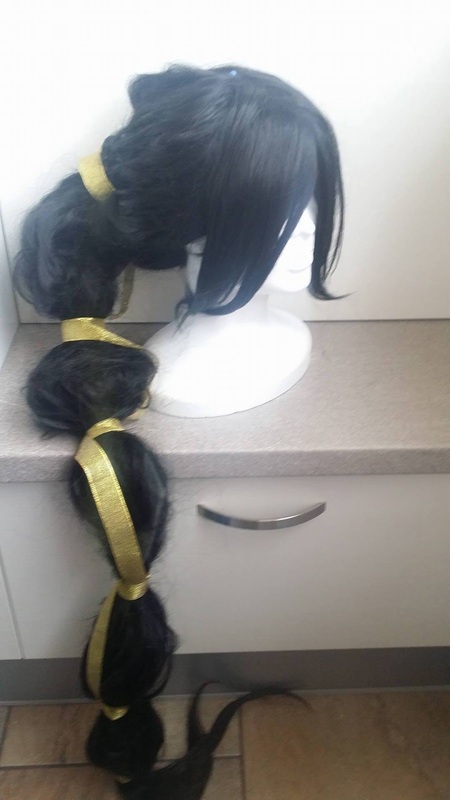 I kinda thinned my wig this way - because I took a lot of hair from my wig and used them for the braids, but the wig is really nice and can handle it. I bought it for around 250 Kč = 9 Euro. 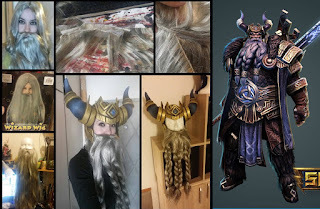 I wanted to buy a long grey beard for Odin cosplay and I have to admit, even on e-bay are these wizard beards and wizard wigs prices pretty damn high! :D So I've done something, that was against all my rules and advices I've written about and I bought a wizard wig and beard, with photoshopped picture and if you look closely, the wig is crepped to add volume to it. So I've risked a lot. 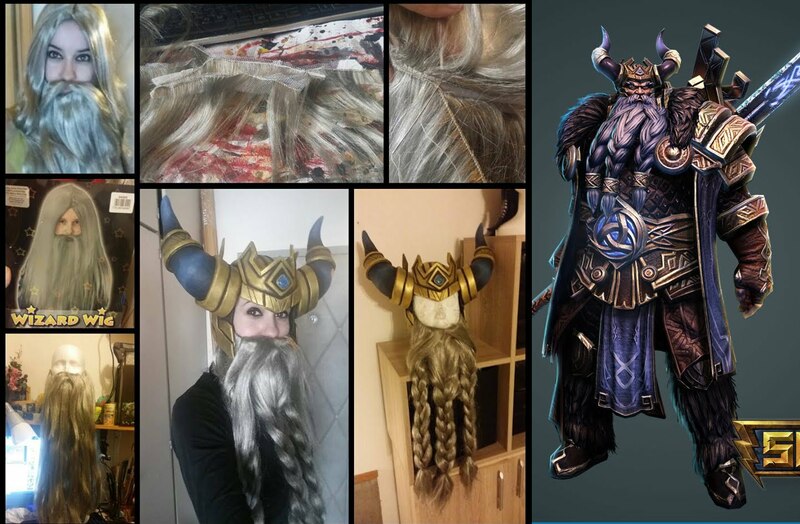 A shiny beard and badly fitting wig came, the overall volume of the beard was bad. So I've decided to cut the wig in pieces and use it for adding volume to the beard. And here's the result - thick beard, that I could braid in three thick braids and I'm really satisfied with it. It's still shiny, but I like it - Odin is a God, so it kinda fits. But if you want to get rid of shine from your wig, you can try to bath it in fabric softener mixed with water (1:2) (and talc powder) for a few days. It cost around 250 Kč = 9 Euro.